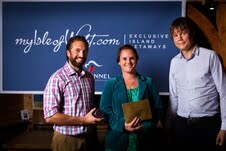 UKSA was delighted to discover we had won an award from myisleofwight.com! The website spent all of 2012 collecting votes in various categories and we came top for Best Watersports Activities Provider. The fact it was all voted by visitors and not just a panel made it even more special for us. Chief Watersports Instructor Dan Hallam and PR Executive Lori Little went to the awards ceremony at the Garlic Farm Café (itself a category winner) on Tuesday night to collect the award. Here they are collecting their award from Tom at Red Funnel Ferries. We would love to win it again next year of course! So add your vote to the 2013 nominations and follow the link to say how much you love UKSA!